Love the product, would definitely recommend to friends and family, very modern and fun design! I was looking for something other than ordinary and this sure did it. 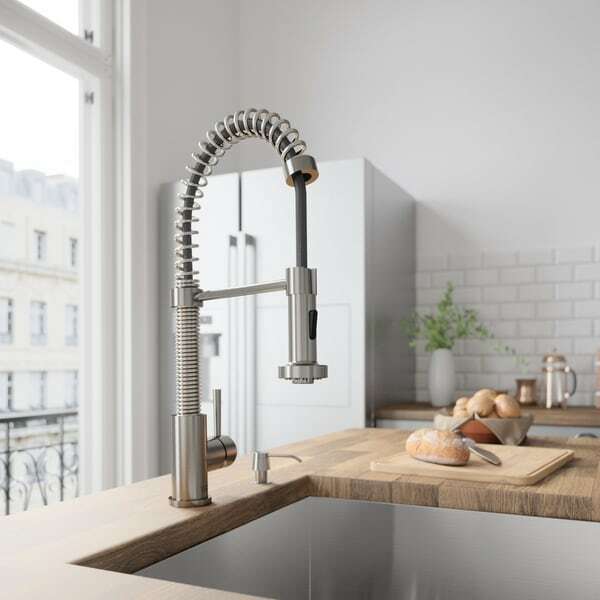 The pull-down, dual action spray head on the VIGO Edison Pull-Down Spray Kitchen Faucet allows for your choice of aerated flow or powerful spray for all your modern kitchen needs. The 360 degrees swivel spout extends up to 30 inches, and its spiral details and solid brass construction make it a highly functional and beautiful statement piece. We just installed this faucet and it's terrific. I do wish the horizontal arm were about an inch, maybe an inch and a half, longer -- I find myself having to lean forward as I wash dishes. Also note that the faucet remembers the spray setting. If it's on spray, it'll stay on spray next time you turn it on. (My previous faucet always reverted to the full stream, not spray, once I turned it off). It's also a little difficult to pull the head out and down -- as you pull the hose through the spring, the spring flexes down, so it makes it a little hard to pull. It also retracts very slowly. However, it's not that big of a deal. Especially considering the low Overstock price, this is a fantastic faucet! We were looking to replace a much disliked kitchen faucet and wanted one of the commercial style coil ones. Everything we ran across was much too large in height, but Vigo makes a number of reasonably sized faucets that we liked, and the overall info I read on the Internet about them was very positive. I installed the new faucet myself, and had more trouble removing the old one than I did with installing the Vigo. However, as noted under the reviews on here for the chrome version of this faucet, the instructions are pretty dismal and not very detailed, and there are a couple of parts not even shown in the instructions. Worse, I found a version of the instructions online with some of those parts shown, but others still not. Anyway, I figured most of it out myself and the only other trouble was that one of the two provided water lines was too short to reach one of the valves under the sink, but I just used the existing line from the old faucet. Additionally, as noted in other reviews, the sprayer head doesn't sit exactly right in the holding arm bracket, but I simply purchased a thick black washer in the plumbing section of one of the big box stores, and placed it at the base of the threads for the head. Once the hose is screwed on tightly, it pushed that washer out, and then head now sits much more correctly in the bracket. I would have given the faucet five stars if not for the poor instructions and the head not sitting straight up and down. Regardless, it seems to be a very well made, solid and beautiful faucet, and the flow pressure is impressive. I looked long and hard for the right faucet when I remodeled my kitchen. I have a rather deep sink and needed something that could reach all around and down. THIS IS IT. If you have a deep sink, don't just get a "pull down" faucet....get one like this that is DUAL--pull down AND out. The quality is superb...so well made. I expect it will last a long time. The only caveat was that the supply lines that were included were too short for my application and I had to get longer ones. Other than that, installation was not difficult and the end result is wonderful. EVERYONE wants to know where I got this faucet. Buy with confidence--you will NOT be disappointed! Another note, I also bought the VIGO 32 in deep sink from Overstock.....it is also fantastic. So pleased with my purchases! So far (1 week) the faucet has worked well. Installation was fairly easy. Very nice brushed finish. Faucet water pressure is good. Faucet temp/pressure control handle isn't exactly as described in the products specification documents. Documents show that the handle should be pushed back towards the backsplash for cold water and pulled forward for hot. This design has been changed. Straight up gives cold water and pulling 90 degrees forward hot. This is a good design change as I was concerned I wouldn't have enough room between the faucet handle and backsplash behind. This faucet is stainless steel and it is beautiful. It works great and will last for a while. I like the faucet. It's nice and solid, nice mounting hardware. The water line which floats in the unit can kink under the sink when pulling the head out. I have reservations about how long that will last. The big problem is the spray head. The spray head eventually wouldn't change very well between spray and stream. Ultimately it was only able to spray. Overstock was really good about getting a replacement head to me. I was told the replacement head was re-designed so as to alleviate the spray/stream problem. Very quickly the replacement unit suffered the same fate as the original. Great faucet at a great price! Bought one in early 2014 and another for a second kitchen in 2016 because I liked the first one so much. Both faucets still look new and function perfectly. I will note, the threads on the handle of each faucet eventually got wobbly in the base piece because the threads had corroded away a bit (after ~3 years in my case, although that may vary by use). That's probably because water drips down the handle and seeps into the threads every time you turn the faucet off with wet hands. That said, I called Vigo and was immediately connected to someone that was able to send me a replacement handle and base piece for free, no questions asked. The person I spoke with (Carlton) said it'd be shipped out right away. It arrived a few days later and took just a couple minutes to replace. Amazing customer support. Thank you! Minor design suggestion for Vigo: Possibly adding a small rubber washer/bushing at the top of the threads on the handle would help shed water away and protect the threads. I don't usually write reviews but the quality of the faucet for the price, and the experience with Vigo customer support has inspired me to write something. I'm actually about to order another one of these (my third stainless Vigo pull-down) for another kitchen project at my parents house right after I submit this review. Thanks Vigo! This is a beautifully made faucet and functional yet dressy enough for any upscale kitchen decor! VIGO Edison’s stainless steel products are very functional and affordable. I am so happy my son talked me into purchasing this kitchen faucet! I thought it would look pretentious so was hesitant to purchase. It looks utilitarian, works like a dream, I love the fact that the control for the water flow is so easy to adjust and the button for the spray is right in front so you don't have to pull it out of the handle to use. I have a 33"x22"10" deep sink and this faucet reaches anywhere I need it plus it is great for washing the huge stock pots that I use because of the height of the spout. I sent a picture to a friend who wants to remodel her kitchen and told her she needed to get this faucet because it is the best one I have ever had! Never thought I could fall in love with a faucet! We ordered this faucet when we renovated our kitchen and it looks amazing and is solid/heavy construction. We always get compliments on our faucet as it has a great look and feel. I would have given 5 stars however the spray function of the faucet stopped working properly after about 4-6 months, it just took me forever to reach out to Vigo to see if they could help, which is what prompted me to write this review. We bought this about 2 years ago, and having waited so long to get a replacement I was prepared to pay for a new part. I emailed customer service from the Vigo website and received a response very quickly. Rashan Nix from Vigo emailed me back on 3/19, mentioned that it had been over a year but he would help me out. I promptly sent him proof of purchase, and by 3/22 they had delivered me the replacement part. The way things are nowadays I either expect shoddy customer service, a manafucterer to not stand by their product or for there to be some sort of error or mixup along the way and end up with the wrong part. Needless to say, Rashan blew me away with the way he handled this! The faucet was replacing another one, which was very similar to this one, so the installation was easy. I think this faucet looks even better than the old one and it definitely works better. It sits higher, so I don't break tall and delicate wine glasses like I have done in the past. It's a very good purchase and looks great in our kitchen. I LOVE IT! It not only looks great, but is easy to use, and the water flow is much stronger than with my old faucet. It is extremely solidly built, graceful,and should last a very long time. And the price was extremely reasonable. I still have this faucet in my kitchen(since11/2015). The packaging was really good and looked very fancy. The problem is the pressure in the faucet is not strong any more and the spray button does not work. If I switched to spray mode, I will have very hard time to switch back to regular mode. The installing was not bad at all My husband did it himself. I will be installed another one later but for now I am okay with one. If you want one to last years and years I would recommend another one. Worked great for the first year or so. AFter that, I started to notice that it wouldn't easily switch between the two modes- sprayer versus nozzle. Now, I have to barely turn the faucet on to be able to switch between the two! There is also some breakdown of the color around the head of the faucet, turning green. (It reminds me of the build up you see on tiles in a swimming pool). I am going to soak the nozzle in vinegar, though, to see if this helps break that down or not. I had no idea what to expect with this faucet - it is heavy, high quality and really a statement piece. We bought it along with a stainless steel farmhouse sink for our new laundry room. It is absolutely gorgeous! We are thrilled! Gorgeous faucet. Very sturdy and easy to maneuver. It’s a focal point for sure in your kitchen. The handle part is not metal but the rest is. We have been very happy with the faucet. Works very nice. Ordering a second. Ordered this one with the VIGO Bingham 33 inch Double Bowl Kitchen Sink. Packaged well and no issues with install/operation. Beautiful faucet. Packaged really pretty too. I’m ver happy with this purchase. It was exactly what I needed for my kitchen renovation. The price is very good compare to other places. Works perfect! High quality at a great price. Cheaper than other retail outlets, faster shipping and great customer service for returns (although this won't be needed!). The faucet is a quality made product. The shipping package it comes in is excellent so as not to cause damage to the product. I pared it with the 50/50 undermount stainless sink and get lots of compliments. The faucet stretches to reach all areas of the sink for easy cleaning and retracts back into position quickly. It has 2 spray modes that chande with just a press of a button. I highly recommend. Really nice unique faucet, and we love it! It is a bit stiff to pull down, and I wish it did come down a bit further on the set position, but it's awesome otherwise. Great spray settings, excellent pressure, and is holding up perfectly. "How long to get to my place?" Standard shipping in the US is 5 to 10 business days. "Is thee a magnet for docking the spray head?" No magnet, but, it locks in place well. There is a U-shape piece on the crossbar it fits into. There is not a magnet, but it easily springs back into it’s dock when you place it back below it. "Can this faucet be used outdoors?" "Does this faucet come with deck plate and soap dispenser?" No deck plate, no soap dispenser. "Hi! Does the bar adjust so you can bring the sprayer lower into the sink without having to hold it the whole time?" Unfortunately, this does not have a height adjustment. "I am looking at this faucet in Stainless steel finish. This is a brushed finish is it not?? I do not want shiny chrome and this says "polished"." It is stainless steel and actually has a nickel like finish. Yes. It has a brushed finish. No glare. Also, unlike another answer, mine stays on spray or stream when I restart it. Wherever I left it set. "Will it stay on the spray setting without holding the nozzle? I like having both hands free while spraying dishes." Yes. When the water is on and you press the spray setting, it stays that way. Once you turn the water off it goes back to stream though - you have to press spray each time you turn the water on if you want it.